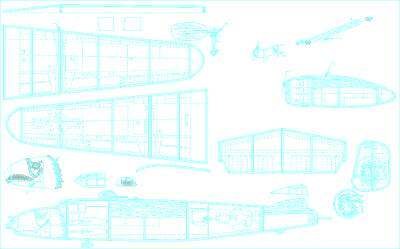 This page provides access to some of the model airplane plans that I have developed over the years. The plans are available for free download. The original drawings have been broken down into smaller sheets to allow printing on standard printers. Each reorganized set contains legal size sheets (8.5" x 14") and letter size sheets (8.5" x 11"). To help insure that the plans will print in their proper size after being downloaded, they have been saved in the Adobe Portable Document Format (PDF). All you need to open and print the plan sets is a copy of the Adobe PDF Reader software. Be sure to set the software to not scale the drawing to fit the page. This will insure that the individual pages will print at their intended size. If you don't already have that software, it can be obtained at no cost from the Adobe web site at http://www.adobe.com . I hope you find something interesting at this site, and more importantly, that you will build some of the models and enjoy them as much as I have. As is the case with most web pages of this type, they are often revised so if you find anything of interest, stop by from time to time.